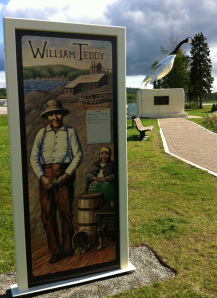 Whenever I am asked to discuss the history of the Wawa townsite, I must talk about William Teddy. Unfortunately we know very little about the man himself other than he was a local Ojibway trapper and guide, and discovered gold with his wife during a picnic on Wawa Lake. Hence the reason his text is so short on his beautifully painted door. While researching his story, I was lucky enough to receive a 100 year old draft copy of a sportsman's log book of a fishing trip in the Michipicoten area. Complete with photos, I was amazed to find images of William as one of the secondary guides used on this trip. Perhpas the text would shed more clues about this iconic Ojibway in Wawa's rich story? No luck! Turns out William was unremarkable and rarely spoke. In fact, it was not until the last few days of their two week fishing trip, that the gentlemen fishermen from Detroit actually discovered that William did indeed speak English. So now you now all I know about Mr. William Teddy.